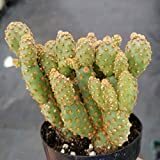 Opuntia rufida growing cactus of the genus Opuntia also known as Blind prickly pear, Opuntia rufida perennial plant used as ornamental plant can grow in desert, subtropical, tropic, mediterranean or temperate climate and growing in hardiness zone 9+. Stem called cladode some refers them as leaves, stems color green with yellow, green or orange spines. Flower color orange or yellow, the fruit color red in oval shape, the peel covers with white hair dots, the fruit maybe edible but there is no indication.